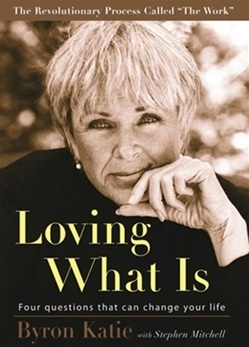 Out of nowhere, like a fresh breeze in a marketplace crowded with advice on what to think and believe, comes Byron Katie and what she calls “The Work.” In the midst of a normal life, Katie became increasingly depressed and desperate. Then one morning, she woke up in a state of absolute joy, filled with the realization of how her own suffering had ended. The freedom of that realization has never left her, and now in Loving What Is you can discover the same freedom through The Work. Loving What Is will show you step by step, through clear and vivid examples, exactly how to use this revolutionary process for yourself. You’ll see people do The Work with Katie on a broad range of human problems, in their relationships, at work, and on their deepest anxieties and fears. Once they have done The Work, they experience a sense of lasting peace and find clarity and energy to act, even in situations that had previously seemed impossible.